So how do I play? What's special about Viking MUD? When did Viking MUD first open? What hardware/software does Viking MUD run on? Viking MUD is a so-called "Multi-User Dungeon" (MUD) game. This means that there are several users (also known as players) who are a part of the same game at the same time. Unlike EverQuest, Viking MUD is not a game with fancy graphics, but a traditional text-based MUD. Viking MUD is a volunteer-driven non-profit organization, with a hierarchical administrative structure. See also The Administration for in-MUD organization. In addition to being a MUD, Viking MUD owns a computer where all our services run. This is currently administered by Jan Ingvoldstad. Network connectivity is through Domeneshop. In order to play, you need to connect to our MUD server via telnet. Before connecting, you should really read our game rules. Don't use the "telnet" command! Recent versions (Windows XP, at least) have serious bugs that make connecting difficult. Instead, download software such as PuTTY. See also our brief document on connecting with PuTTY. Viking MUD is running on connect.vikingmud.org (194.63.250.163) port 2001. If you want to play, use a specialized MUD client, or open a telnet connection directly. For the experienced LPMUDder, Viking looks very much like old Genesis, the first LPMUD. We have not changed the layout of the backbone area, mostly for nostalgic reasons. However, other things are very different from the 2.4.5 mudlib we started evolving from in February 1991, such as the various areas that have been added. VikingMUD is a rather social MUD. Communicating with other players (the commands tell, shout and chat) cost no spell points. There are several so-called guilds on VikingMUD. Viking's "official" opening date was the 7th of February 1991, so we're definitely one of the oldest MUDs still around. Except for two longer (more than a week) periods of downtime in 1992 and 1993, Viking MUD has been running almost continuously since the first startup (even since the testing began in the autumn of 1990). Viking is based on a top-down power and responsibility structure, and is not a democracy. Administrator Main authority, Boss, God, whatever. The buck stops here. Arch Wizard Person responsible for administrating a particular area of expertise. Jr Arch Wizard Arch Wizard in training, inexperienced arch wizard, or arch wizard with smaller responsibility. 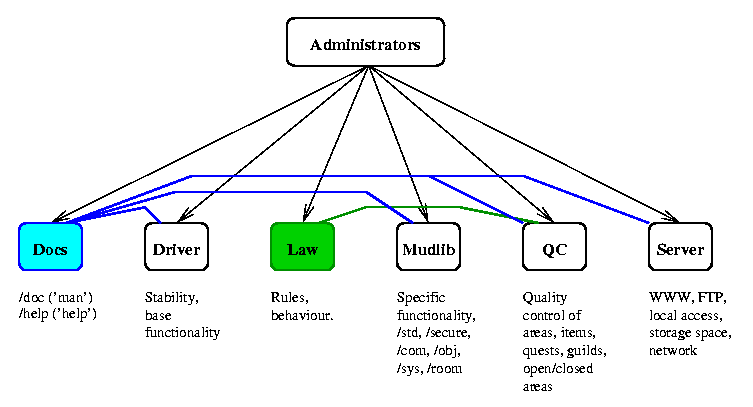 Here's an illustration of the department hierarchy. Documentation is something that both driver, mudlib, QC and server people deal with, while the QC and law departments tend to cooperate on related issues. If there are no specific arches with responsibility within a department, that responsibility defaults to the administrators. The main page shows an image of a tree, with the letters "Viking MUD" at its roots. The tree is Yggdrasil -- the world tree of Norse mythology. The picture was made by Jan Ingvoldstad (Dios). A smaller version appears near the top left on each (more recently updated) page on this site, linking back to the main page. Viking MUD primarily runs under some kind of a Unix system. For more details, look at our system information page.